Manufactured from 100% recycled rubber tires. 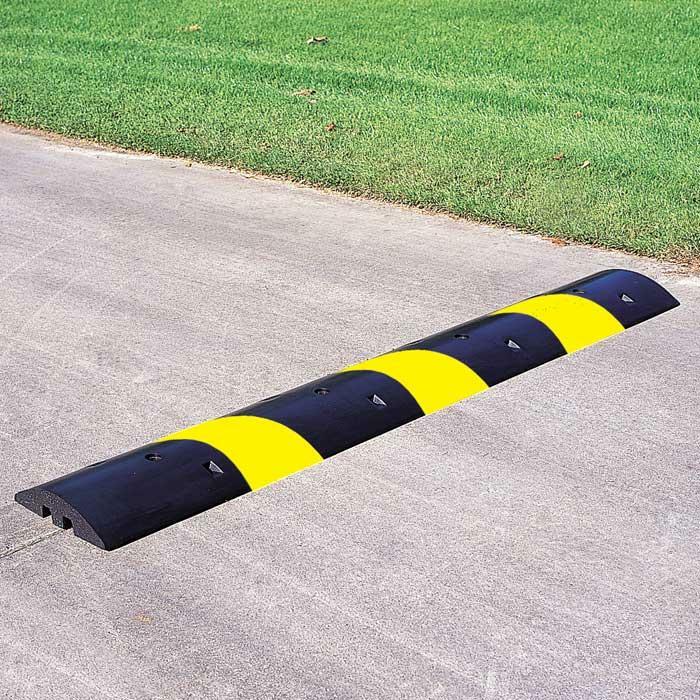 Superior construction ensures that this speed bump will not warp, crack, or chip. Easy handling and storage. Easily installed by one person. Resistant to ultraviolet light, moisture, oil, and extreme temperature variations. Channels at the bottom of 1.25 x 1.25 for drainage, piping and cabling. 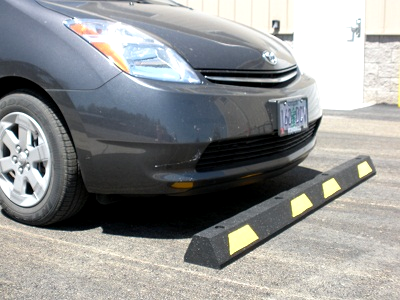 Parking Curbs - Car Stops help ensure vehicles stop at the proper location when parking preventing damage to buildings, sidewalks, curbs and delicate landscape. Inside, they function as bumper cushions and protection for motorized carts, forklift trucks and vehicles operating in factories and warehouses. 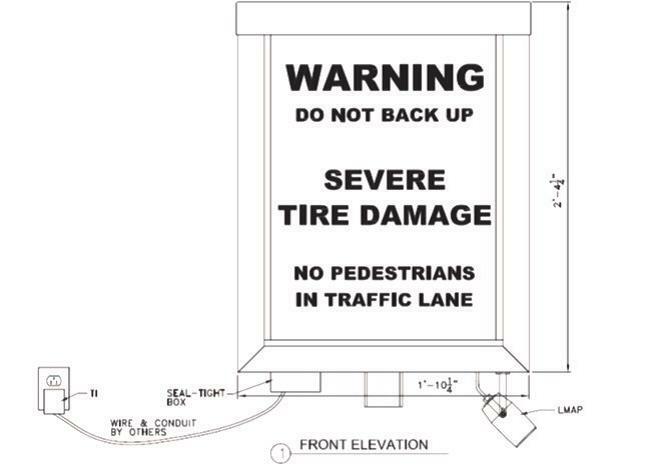 Ideal for retail/commercial/business parking lots, parking garages and municipalities, wheel stops provide needed order by delineating parking spots and ensuring proper distancing. 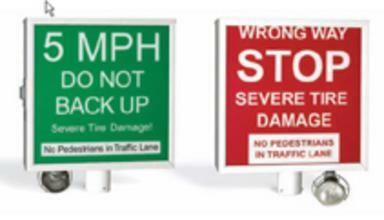 Heavy Gauge Aluminum Insert Surrounded by a 14 Gauge Steel Tube Frame and a mounting point for a 2" OD Pipe Post This sign is highly reflective and requires no power source. Need a Price? Email us for a written cost estimate. Easy, no hassle custom quotes. ST-6' 4 holes, 8 stripes, 40 lbs. ST-4' 3 holes, 4 stripes, 30 lbs. ST-3' 2 holes, 4 stripes, 20 lbs. 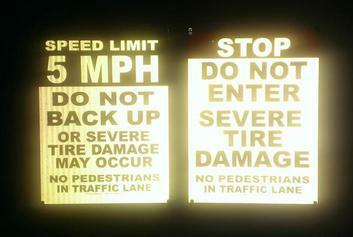 Permanent reflective striping - no painting! Hardware installation holes are drilled with a ½ drill bit. 14" x ½" rebar spike with 5/8" washer for asphalt or gravel installations. 4 ½" x ½" lag screw, washer and short shield for concrete installations. Use 10 ounce of epoxy or construction adhesive (ie Polyurethane PL Premium) for installations where no hardware is allowed. Also Available in Illuminated LED version, includes a flood lamp to focus on to spike strip for added safety at night time. Designed for traffic speeds up to 15 mph. weather, salt, moisture, UV, oil, and temperature. Made in the USA. Prompt shipping. Will not warp, chip, or crack. Easy, one person installation (instructions included). Installation hardware is available. 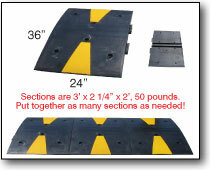 Removable for surface maintenance, snow plows or to relocate at a new site. Molded-in yellow road marking tape stripes.